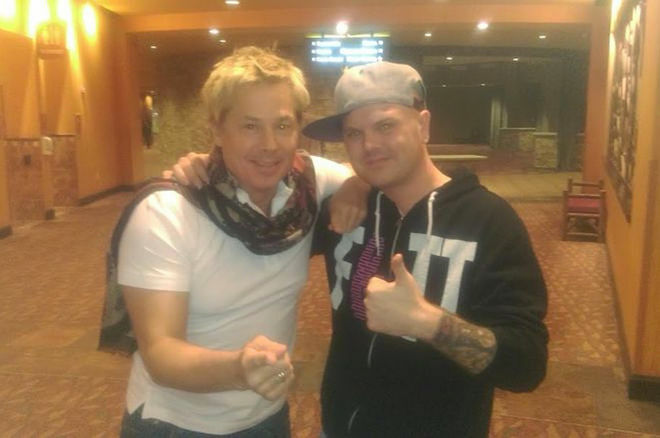 Another entertaining PN Blog entry from Noah ("nit3runn3r") -- cash game fun, and Kato Kaelin! Welcome back, my fellow poker grinders. Or those just interested in hearing about my experience with everyone's favorite house guest, Kato Kaelin! This particular blog is from the summer of 2015, in which I was on vacation from funeral service classes. I was playing poker to pay the bills until the time was right to move "all in" on the mortician lifestyle. Here's another chance to read about how I went from death by a river card, to death by life: "Life Is A Gamble When I'm All About My Poker Chips". This blog will be strictly poker-based, so get ready to read about a lot of hands. Some are pretty standard, but as usual, I will go over the tricky ones or explain why I did what I did in a hand, whether it was GTO or just not correct at all. Either way, here we go! The first day of playing, a Monday, starts as usual, by going to my local casino, the Potawatomi Hotel & Casino in Milwaukee. I take my seat and am pleased to see a gorgeous Asian woman sitting at my table. I know, typical male, eh? But around here, we don't have too many women that play, so that is always a welcome sight. I actually give women players more credit than men, as their minds work differently and in my eyes, they know what they're doing more than most at the felt. Anyway, the first hand I play would question that. I have my favorite hand, (offsuit, though) in the SB. Two people limp, I complete the blind, and the BB checks. The flop comes out . I lead out for $10 into a pot of $12. I get two callers, the original limpers, one being an older gentleman and the Asian lady. The turn is a , putting a straight draw out there, but no flush draw still. I believe I just checked, and it checked around as well. The river brings us an , and stupidly, I bet $15 into a pot of $42. I don't know why, as I have showdown value and no one is calling me with worse there. Stupid bet by me, as I am reraised to $45 by the man and the lady then calls his raise. I obviously fold, shaking my head at my play of leading out the river. The hands are shown as follows: for the man, for the lady. Ouch! The man made a terrible raise (or actually genius raise, depending how you look at it, claiming to have the straight possibly). Well, the lady had the straight. Still, I don't get why she called my flop bet. Maybe after the man called, she felt the turn could bring an ace or a draw, or even a seven might be good. Either way, I lost my first hand. After a few hands of not playing, the boyfriend of the Asian lady wrapped himself in a cool looking scarf (casinos are always cold, actually). I commented on how I wanted it, as it looked pretty chic. A few of us then chimed in on how it made him look "Hollywood" and then mixed with the way he talked (an accent that wasn't from around here), he had a nice image to him. He said he is from Los Angeles, but originally from here in Wisconsin. Someone asked him if he was who he looked like and he said yes. I didn't hear what was asked, but I said to the guy next to me, "He looks like Kato Kaelin." To which the man in the scarf overhead and spoke, "Yes?" Suddenly, it hit me. It is him! Wait, is it? I asked if it was and he replied yes. I immediately asked for a picture, haha. He obliged, but only after we were done playing. Cool, right!? He said he was in town for Summerfest (our city's musical festival that lasts a little over a week) with his girlfriend. So, after this little awkward gabbing and gawking by most of our table, we got back to playing cards, just like regular folks. I mean, it's not often around here you get to meet or even play poker with a celebrity am I right? This is Milwaukee, WI. Shameless plug time: Check out Kato's website and clothing line — Slacker Wear. Back to the poker, sorry. So the next hand I would play is for a raise with for my usual preflop amount of $10. I receive one caller, the woman. The flop comes out . She checks and I bet out something like $15 into $24, as the blinds both folded. She calls. The turn is a and we both check. I tried to hesitate a little in my check, as I know the only way I'm winning this hand is to play it off as if I have a full house now. So even if she has or , I would have her beat — but remember, I only have jack-high at this point. So the river is a meaningless . I am playing the two pair on the board and have jack-ten — that is, nothing. She checks and I think for awhile and bet $25 into $54, basically betting for value if I have the ace or the king. She thinks for a while, and folds. Kato then says, "You didn't have an ace or a king." I said that the only way I can win is by betting — not really confirming, but saying it in a way that I'm trying to convey I might have bluffed. I probably did, unless she had worse than my jack-high (since only a queen beats me there or if she had a king and somehow laid it down, thinking I had an ace). Regardless, I raked in the pot to bring myself in the black. After a while, a few players limped in and I called the blind with from my SB. BB checks and we see a flop of . I lead out for $10 into a pot of $15 (three limpers and us two blinds). I get one caller, the BB. The turn is a . I lead one more time for $15 into $35, thinking I find out right now where I'm at, and sure enough, I do. The BB goes all in for another $100. I know I'm not calling, but want to think the hand through still. I tell him I have a seven, and ask if he's making a move or has me crushed. I know he does, but this is an opportunity to gain information for later on or to hone my reading skills. Finally, I deduce that he has , and say that out loud. "I'm going to guess your hand. I think you have five-six, that makes the most sense to me." I show my seven, and say something like I was doing so just to show I was being honest, or whatever. He says it was a nice fold and shows... ! Boom! Pat myself on the back for that one. The next hand I played was in my SB. What, do I only play my blinds? Haha, sure seems that way, eh? Anyway, a few players limp and the button makes it $10. It's a pretty small raise with a couple of limpers, and figuring they will all call, I'm definitely calling that. So as expected, we all called, swelling the pot to like $43. I know it was me, the lady, a bearded guy and the original raiser, so four of us altogether. The flop comes out . I check and it checks around surprisingly. The turn is another , giving me three queens, but also putting a diamond flush draw out there now. I lead out for $15 this time because I definitely want value out of my hand now, as I have a pretty strong hand. I get one caller, the beardo. The river is the , the third diamond on the board. Still a straight possibility out there, a full house to beat me and the backdoor (running cards, turn and river) flush. I check, just being fine with the showdown or calling a bet. Well, he bets out $34 into $73, totally value-towning it. I sigh, and say, "Did you go running diamonds for the flush? I really think you did again." He did this earlier after being allowed to get there through checks all around and then bet the river afterward. So this is the same scenario as a hand he played previously. I really think it happened again, but I have to see if I'm right and my reads are still spot on. I call and he shows me the flush with or something low like that. He then says, "Wow good guess again, you knew it." I shrugged my shoulders, knowing I was right, but it did cost me. Oh well. So after those hands, I'm down to around $200. I always buy in for the maximum (which was $300 here, $1/$3 no-limit). I also don't reload (bankroll reasons) and have a buy-in/stop loss of one — so if I bust, I'm done. I understand this doesn’t give me the best option to fully play my A-game while also limiting myself. However, if I just don't have it going that night, so be it. I need to limit my money and stretch it out as much as possible this summer. Better to play cautious before my final year of college and make sure I get through it! We had gotten a new player at the table and he had been playing pretty aggressively. Somehow, I managed to win a few pots of just your typical continuation bets to bring myself almost back to $300. Then, against the new player, the following hand happened. I had raised preflop to $10 with . He calls, naturally, from one of the blinds. It's irrelevant which one because the other blind folded, so it's just me and him. The flop comes out , two spades. I immediately tell myself no matter what I'm going for it all against this guy. The pot sits at $24, he checks to me and I make it $15. He raises me to $40 and says, "If you want to go, let's go." I say okay and shove my stack in the middle. Maybe a bit of an overshove, but depending on the turn, that might kill my action. And against this guy, I want to get as much in as I can now, as he clearly was ready to go, too. So he calls my all in of about $300, and the pot now sits a little over $600. I flip my hand up and say I need a spade. Well, the turn is an ace, so that might be good against him (I don't know though as he hadn't show his hand yet). It wouldn't matter, though, as the river was the beautiful ! The nuts! I have the absolute best hand possible and double-up. He ended up mucking his hand, so the world may never know. After a little bit more of playing and just hovering around that $600, I make a raise with and get one caller. The flop comes out . He checks and I lead out for $15. He calls. The turn is a , now giving me a straight draw and still the two overs. He checks and I check. The river is a . So basically I'm playing the board with ace-high. Unless he has a pocket pair or anything on the board I have the best hand. He leads out for $50, though, which surprised me. I was kind of taken aback, actually. It made no sense. Call me preflop, check-call the flop, then check the turn? What is he really representing here? Well, unless he played it really well with something like , or , he shouldn't be leading out that much, because a better pocket pair would have surely bet at some point in the hand instead of the river. Hmmmmm... I really think I'm good here. Eventually I fold, though, because he had just sat down and I didn't know how he plays. He shows me . Ugh. We would have split the pot, but I knew his play didn't make sense. My reads were so good all night and on that one I didn't pull the trigger. Boo me. Soon after, Kato's girlfriend (who we found out is named Leyna Nguyen, now moonlighting as a newscaster in Los Angeles) busts and they decide to be done for the night. So Kato goes to cash out, but first looks over to me and asks if I want that picture still. Of course I do! Ha. What a cool guy right? I chat with his girl for a bit as he cashes out and she said she would take the picture of us. How nice! So we take the pic, he asks my name and says it was fun playing with me tonight. Hey man, the pleasure was all mine. Even though he is a celebrity, he was just a down-to-earth guy trying to play some cards with his beautiful girlfriend. Can't hate on that. A few hands later, I would get UTG and make it $10 again. I get three callers this time and then the same guy from the previous hand makes it $100! Sheiza! Right away I throw my hands up and say, "C'mon man, what are you doing? Why do you bet so much always? Is this another bluff, are you stealing from me again?" Knowing I still have the other three left to act behind me, it's really either all in or fold (the guy had another $100 behind) since he put half his stack in the middle. If I'd had ace-king suited, I probably would have went with it, but I folded, realizing I only had $10 in, so it's never a mistake to just fold when such strength is shown sometimes. In this spot, I think it was a good one. The others folded and he showed . Okay, I guess I can understand you not wanting to see a flop or protecting your hand, but that's way too much to do so... right? Maybe it isn't. After that I'm reeling because of this one guy just confusing me. And I'm tired, and hungry, and probably should leave since I'm beginning to go on tilt. Never a good sign. So I realize this and wisely decide to just leave. But not after I play my button. As I'm racked up and ready to leave with my $300 profit, I get . Of course! The guy from the previous two hands limps in and I raise to $15 this time, and he calls. The flop comes . He checks and I check. The turn is an . He checks and I bet $40. Why? I don't know, I played this pretty poorly on the turn. If I'm betting, I may as well on the flop and if he calls, we can both check the turn then. So I screwed that up badly. He calls the $40, now putting the pot at $104. The river is a . Well, I hit my K at least, right? He then makes me sick by going all in. Ugh, just a disaster. I almost want to spite call this guy, but again, the only thing I beat is a bluff. His play makes no sense, but can I really call this? I decide that I've had enough, and this guy just outplayed me the last half-hour, so I fold face-up and say I'm out of here. He shows . Wow. Despite pulling out a profit and meeting and getting a picture taken with Kato Kaelin, this guy really had me wondering what the hell I was doing. I felt disappointed and frustrated with my playing, even though I probably made the right decisions in two-thirds of the hands I played against him. So there you have it, probably one of the most fun sessions played in my "live" poker life. I say "live" like that because I used to play online a lot back in the day, and had some pretty cool moments against some top pros (good and bad) while making some money and notching quite a few tournament victories. It was just a good, clean, fun vibe and I love poker sessions like that. No animosity (my whining wasn’t that bad, Hellmuth). No hate. Just playing cards and enjoying a little profit. If every session went like this, I’d be ok with it. Peace out and good luck at the tables. Kato Kaelin has left the building. For daily exploits on my life, follow me on Twitter at @NoahWatryTV. This article was written by one of our community members as part of the PN Blog. The thoughts, opinions, and strategy are those of the user only and do not necessarily reflect the positions of PokerNews. We appreciate your feedback, but ask that you be respectful of our PN Blog users who have generously donated their time. You can learn more about the PN Blog here. The Long, Winding Road to Tournament Poker Victory or Heartbreak City?